Will DeKalb learn from the departure of Tinez Tacos? 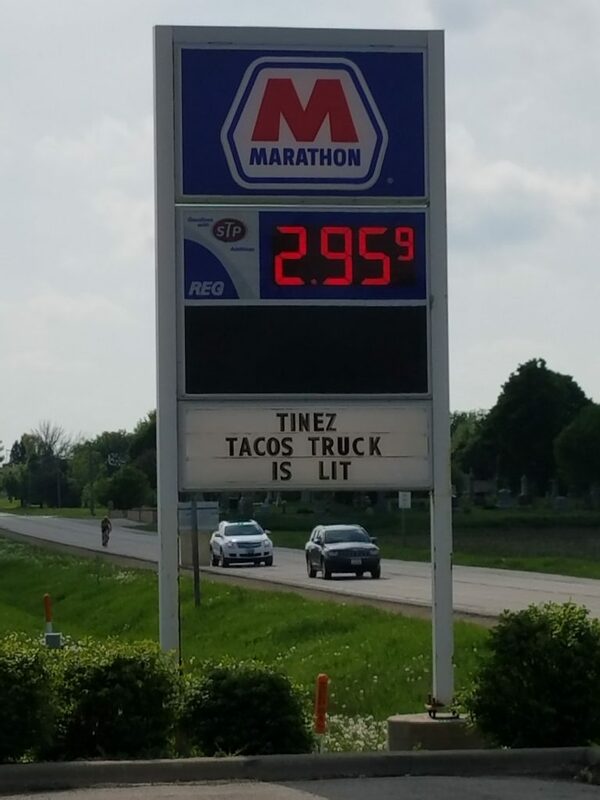 Last weekend I found out that the owners of the Tinez Tacos food truck have worked out a parking spot in Malta, and will serve from 11am to 7pm weekdays this summer at Hickey’s Corner Store. If comments at the City Barbs Facebook group are any indication, residents of DeKalb wish them well in their new location. They’ve obviously picked up local goodwill. City of DeKalb, though, not so much. If you haven’t been following this story, it’s about the Tinez folks’ mobilizing toward more affordable options, since DeKalb charges monthly license fees that bear no relation to reasonable administrative costs. The city also collects sales taxes — our home-ruled restaurant/bar tax pushes taxes to 10% of a tab — so the ongoing fees are double-dips, too. The question is whether the city will get a handle on the greed, ineptitude, and/or hostility that this money-grubbing behavior represents. With an improved city council and a pending change of city manager, it’s possible. Unfortunately, staff members so far are busily playing the victim in the story. Recently, a newspaper story was published with regard to food truck operation in DeKalb. That story indicated there was a food truck vendor who felt that the City license fees were excessive, and the standards were inflexible. Surprisingly, the City was not contacted by the food truck vendor with any concerns, nor was the City contacted by the newspaper with any questions regarding the story. Had either party contacted the City, they could have been advised both of the flexible approach that the City is taking to special events and food trucks, and the current provisions in City Code that allow the Mayor to waive or reduce fees for food trucks upon request. In other words, the City was addressing this issue before the public or media had raised any questions or inquiries regarding the process or current regulations. Speaking of which, I recently submitted a Freedom of Information Act (FOIA) request asking for records related to business-retention activities in 2017, and a search turned up zero documents. An occasional non-inspection-related visit could prevent future embarrassment and is a much better look than the excuses and defensiveness we’ve seen here.